In the wake of the ETA ceasefire, John Dorney takes a look at the historical similarities and differences between Irish and Basque nationalism. To many Irish people, the events of this week (September 6, 2010), with the armed Basque separatist group ETA declaring an end to its attacks, have a strangely familiar ring. An armed nationalist group, variously pilloried as terrorists, lauded as freedom fighters and provoking also ambiguous reactions verging from contempt to quiet admiration, declares a ceasefire. The metropolitan government voices caution and declares that the end to violence will not be credible until arms are handed over. Other nationalists welcome the move and call on the government to engage with the political wing of the armed movement. All of the above could equally be said of the Provisional IRA’s ceasefire of 1994 as of ETA’s announcement in September 2010. 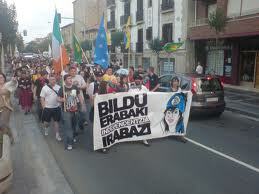 There are other very obvious parallels between the Basque and Irish situations. What radical nationalists think of as the Basque Country, or Euskal Herria, comprises of three provinces of France and four in Spain. The Basque Autonomous Community has just three provinces in northern Spain. Thus for the radicals, or abertzales, as they call themselves, the current Basque institutions are “partitionist”, the nationalists who accept them are “espanolistas” and the Basque police are “cipayos” (“sepoys” – an analogy to native troops in British India). It doesn’t take a great leap of imagination to find the equivalents in the world view of Irish Republicanism – Northern Ireland as a British-occupied statelet, the Republic a partitionist sham, its police as “Free State” traitors and its nationalist opponents as “West Brits”. 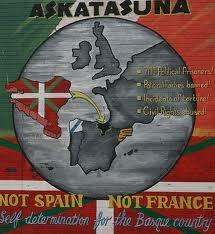 Nor have the similarities been lost on either Basque or Irish separatist movements. Sinn Fein and Batasuna (the currently banned Basque separatist party) routinely send delegates to each others conferences and Sinn Fein personnel regularly travel to the Basque Country to advise on the peace process there. But how similar are the two movements really? A look backwards into history reveals important similarities but also significant differences. Perhaps the most long standing and powerful basis for Irish nationalism is in the historical grievances of the Irish Catholic community. While Irish Republicanism itself has had strong secular features at times, its core support has always come from the Catholic community and this remains the case in Northern Ireland today. Historically, since the mid 17th century until the 19th this community, an ethnic mixture comprising of Old English as well as Gaelic Irish, found itself dispossessed of land and excluded from political power, in favour of an administration based in England and a ruling class, landed and economic, largely composed of Protestant settlers from Britain. Nothing like this has ever existed in the Basque Country. If anything, ethnic Basques in the 19th century found themselves in a superior position to the workers from other parts of Spain who flocked to the region to work in the Basque Country’s burgeoning industries. In fact, one aspect of early Basque nationalism, as articulated by its founder, Sabino Arana, in the late 1800s, was hostility to such immigrants, who could be derided as dirty, un-Basque and irreligious. Moreover, while in Ireland, Irish Catholic folk memory, being both excluded and defeated by the state, generally celebrated its hostility to Britain, until the 20th century, this was simply not true in the Basque Country. Many Basques of the early 19th century fought to protect the autonomy or fueros of their provinces, but they did so as Carlists, loyal to the “traditionalist” branch of the monarchy in Madrid against “liberal” line. So according to one interpretation, Basques were actually a repository of the real Spanish identity. The idea that the Basque Country was occupied and oppressed by Spain only really became a reality after the Spanish Civil War, when the Basque nationalists sided with the Spanish Republic against the right wing military uprising. Two Basque provinces, Guipuzcoa and Viscaya declared themselves autonomous during the war. With the victory of Franco’s forces, the two “traitor provinces” were harshly dealt with. Many nationalists were executed and imprisoned and the Basque language was banned. Modern Basque separatism and ETA in particular, is therefore closely bound up with opposition to the Franco dictatorship and with left wing politics. The radicals close to ETA argue that without a Basque right to self determination, the dictatorship has never really ended. The point is that whereas in Ireland, particularly in Northern Ireland, where you stood on the national question was largely determined by your family’s religion, origin and class; in the Basque Country it has always been much more fluid. There are children of Andalucian immigrants who have joined ETA. And there are also native Basque speakers, with unbroken Basque ancestry, who support the unity of Spain. An outgrowth of this difference is that while nationalist conflict in Ireland could sometimes be described as a conflict between communities, this was never true in the Basque Country. It was and is an ideological conflict, running across linguistic and class lines, over what the Basque Country really means. Is it an oppressed nation or a region of Spain? If those are important differences, there are also intriguing parallels. Both Ireland and the Basque County are home to very old languages – Gaeilge and Euskara respectively. In both places, the languages, (neither of which are any relation to English or Spanish respectively) are associated very closely with a traditional rural culture and with national identity. In both Ireland and the Basque Country, the languages of the towns and cities had long been English and Spanish, well before the rise of nationalism in the 19th century. In the late 19th century, both Basque and Irish languages, as well as the traditional customs that supported them, looked to be in deep trouble. In Ireland’s case, by emigration and language shift in Irish speaking areas. In the case of Basque, by the advance of Spanish with the rise of industrialisation and the arrival of many thousands of Spanish speakers into the Basque Country (persecution of the language also became a factor under the Franco regime). 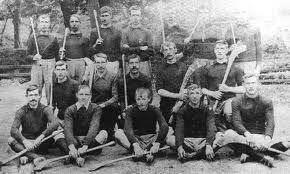 The interesting thing is that in both places, at roughly the same time – from the 1890s onwards, the native language and also things like traditional sports –in the Irish case hurling, in the Basque pelota (like handball) – became political symbols for national identity in a way they had never previously been. In Ireland, nationalists formed the Gaelic League, the Gaelic Athletic Association and the Fianna to promote Irish language, sports and customs. In the Basque Country, the newly formed Basque Nationalist Party, or PNV, promoted the use of euskara, held festivals, encouraged pelota competitions and formed mountaineering clubs to appreciate the beauty of the Basque Country. This fear that what makes “us” different and special is under mortal threat is common to both Irish and Basque nationalism and can provoke the most radical actions. 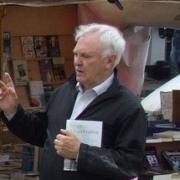 In 1916, Desmond Fitzgerald, an Irish language enthusiast and member of the Irish Republican Brotherhood, justified the armed insurrection of Easter 1916 on grounds that if things continued as they were, “it would be futile to talk of ourselves other than as inhabitants of that part of England that used to be called Ireland. In that state of mind I had decided that extreme action must be taken”. In both cases, armed action was not only a tactic for achieving independence, it was also a way, for some, of saving national identity. “We” were the people who fought against “the oppressor”. (Some more thoughts on this mentality in 1916 here). This emphasis on action can have positive consequences. ETA, unlike previous generations of Basque nationalists, made no distinction between children of immigrants and “ethnic” Basques. One researcher, Jeremy MacClancy records: “To members of Herri Batasuna, Basque patriots are abertzales, a status not defined by birth but by performance: an abertzale is one who actively participates in the political struggle for an independent Basque nation with its own distinctive culture. One told me: ‘not being born Basque doesn’t matter, I feel Basque’ ”. The emphasis on action over orgin can be positive but can also lead to a murderous intolerance. Similarly, Irish Republicanism has always welcomed those outside the Catholic community provided they are committed activists. It can also, however, lead to a murderous intolerance. If the “real” Irish or Basque people are those who take part in the struggle, then those who do not, or who oppose it, are not only traitors, but not true compatriots at all. Ernie O’Malley, for instance, IRA leader of the 1920s, recalled stating in 1921 that, , “the people of this country would have to give allegiance to it or if they wanted to support the Empire, they would have to clear out and support the empire elsewhere”. Notice that it was the revolutionaries who would decide to whom the people should give their allegiance. O’Malley, in the Civil War, ended up turning his guns on other Irish nationalists. Similarly, in modern times, ETA has targeted Basque politicians, journalists and academics who have spoken out against it. The Basque sociologist Begona Aratxaga called this, “the ruthless and authoritarian policing of identity”. Another intriguing parallel is the importance of the “split” in both movements. Both ETA and the IRA split in the 1970s, and along similar lines. 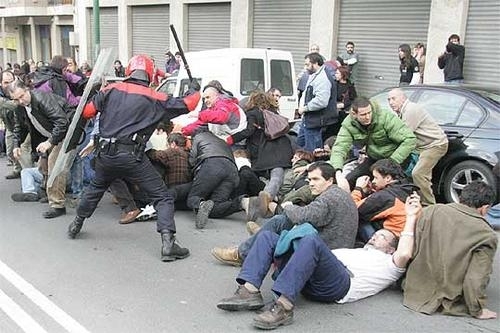 In both countries, a left-wing faction – the Official IRA and ETA Politico Militar, renounced the use of violence in favour of the primacy of political action. The Official IRA called a ceasefire in 1972 and ETA PM in 1980. Another faction committed to “armed struggle”, respectively the Provisional IRA and ETA Militarra continued their campaigns and eventually became the sole bodies claiming to be the IRA and ETA. Both the Official Republicans and ETA PM instead concentrated on their political parties, respectively, the Workers’ Party and Euskadiko Ezkerra (“Basque Left”) letting their armed wings fall into abeyance. The really curious thing is that the WP and EE followed an almost identical path, first rejecting violence, then reviled as traitors by their former comrades, coming to view them, the militarist nationalists, as the main cause of the problem and finally ending up in moderate social democratic parties that rejected not only violence but also the precepts of separatist nationalism. Most of the Workers’ Party activists of the 1980s are now to be found in the Irish Labour Party – some others, notably Eoghan Harris, have actually worked for northern unionist parties, such was their dislike for the Provisionals. Similarly, Euskadiko Ezkerra merged with the Spanish Socialist Party or PSOE in the 1990s. Currently in government in the Basque Autonomous Community, they have outlawed not only Batasuna but also any public act that, “supports or glorifies terrorism”. If there are philosophical and ideological similarities between Irish and Basque nationalism, there have also been concrete links going back to the 1920s. Such was the admiration of some Basque nationalists for the Easter Rising of 1916 that they located their national day, the Aberri Eguna, on Easter Sunday. 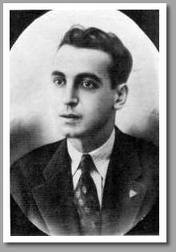 After the fall of the Basque Country in the Spanish Civil War in 1937, nationalist leader Eli Gallastegi, nicknamed Gudari, or “soldier”, was granted asylum in Ireland, where he settled in county Meath until 1958. Moving on to the 1970s, when both ETA and the Provisional IRA emerged as formidable armed organisations, there has been a long series of contacts between the two movements, including, allegedly, exchanges of weapons, explosives and expertise. In the 1990s, as their armed wing weakened, ETA launched a campaign of street rioting in the Basque Country known as Kale Borroka (street struggle) – based apparently on admiration for republican street fighters in the nationalist ghettos of Northern Ireland. In the present day, several ETA and Batasuna activists, fleeing arrest and imprisonment in Spain, including the hunger striker Inaki de Juana Chaos, have found refuge among republicans in Ireland. Ogra Shinn Fein, the republican youth movement, make an annual trip the Basque Country to visit Segi, their (now outlawed) opposite numbers..
Sinn Fein leader Gerry Adams, who is close to people in Batasuna, has urged the Spanish government to respond positively to ETA’s cessation of violence this week. However, the Basque separatists’ ability to benefit from a political process has been severely damaged by their bungled handling of past ceasefires. In 1998, inspired largely by the Good Friday Agreement, ETA called a permanent ceasefire, only to break it two years later. Again in 2006, the organisation called a “permanent truce”, but again broke it months later with a bomb in Madrid airport. No Spanish government would now dare face the public opprobrium of risking another failed peace process. While the IRA also broke its 1994 ceasefire in 1997, thereafter the Sinn Fein leadership of Gerry Adams and Martin McGuinness maintained strict and ruthless internal discipline until well into the peace process. The Basque separatist movement has no such clear leadership. Arnaldo Otegi, the leader of Batasuna, is currently imprisoned on charges of “glorifying terrorism” and it is in any case, by no means certain if the political wing of he movement has ever been able to tell the armed wing how to act. 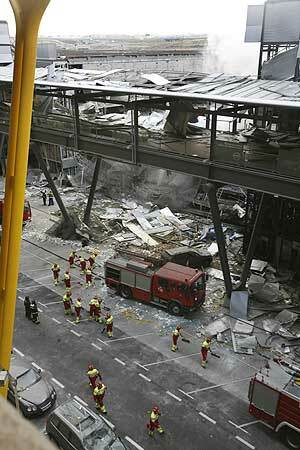 ETA’s bomb at Barajas airport that ended thier ceasefire in 2007. Finally, the Northern Ireland Peace Process had its end result mapped out well in advance – power sharing between nationalists and unionists within an autonomous administration in Northern Ireland. There is no such clear solution to the Basque question. Part of the historic Basque Country already has extensive autonomy. Self determination of the Basque Country is not something that the Spanish government will permit –nor could it, in any case, legislate for the French Basque provinces. Moreover, while Northern Ireland is a major financial drain on the United Kingdom (up to 70% of the six county economy comes from British public spending), the Basque Country is one of the richest parts of Spain and a net contributor to its tax base. 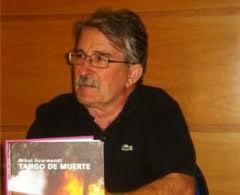 It is, as Irish journalist Paddy Woodworth has pointed out, simply inconceivable that Spain would say of the Basque Country, as Britain did of Northern Ireland, that it, “has no selfish or strategic interest” there. The best that ETA are likely to get out of any negotiation would appear to be an exchange of arms for the release (or at least repatriation to the Basque Country) of its 800 odd prisoners. For Batasuna (banned in 2001) and the wider separatist movement, legalisation and their return to politics is the short term priority. Whatever the result of the current phase of politics in the Basque Country and in Ireland, the links between Basque and Irish separatists have proved strong and enduring. There is, as this article has argued, important common ground between the two movements and such links will no doubt continue in the future. You can read his MA thesis on cultural conflict in the Basque Country here. Mikel Azurmendi, La Herrida Patriotica, 1998, p64-66. Written by: John_Dorney on 7 September, 2010.on 25 October, 2018. 7 Responses to "Irish Republicanism and Basque separatism – parallel movements?" As an Irish student from Dublin who is currently studying in Bilbao, I found this article to be interesting and thought-provoking as I didn’t really understand why some Basque nationalists (or so they claimed to be!) upon knowing I’m Irish, automatically start acting like I’m their best friend! Éire and Euskal Herria share rich, ancient and beautiful cultures. But both the Basque country and Northern Ireland share a tense, awkward and tough situation and I hope that the future will be bright for both of them. Go raibh maith agat as do tuarascáil! I’m by no means an expert on 19th century Basque linguistic geography, but Bilbao itself the birthplace of the PNV was certainly mainly Spanish speaking at that point. I can’t speak about San Sebastian/Donostia (which in the 1870s had only around 20,000 inhabitants) but certainly today the city itself is largely Spanish speaking (though a lot of people I met seem to speak Basque at home and Spanish in the street). The countryside around it is another story of course. But the point I was making was that in both 19th century Ireland and the Basque Country, the first language of most urban areas had already shifted, which I think is basically true, give or take the odd exception.